This season we’re hunting down 100 objects that define Watford Football Club. Each provides a evocative memory or time in Watford’s history. They can be historic objects that define the most important moments on the pitch or personal objects that define your relationship with club. To play your part email your suggestion to podcast@fromtherookeryend.com. Here is our second object, a very special object to From The Rookery End presenter Jason. 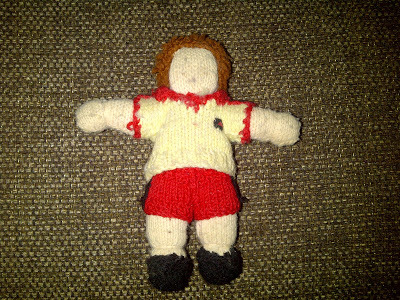 Object #2: Jason’s knitted Wilf Rostron. Let’s go back 30 years or so. Yours truly was a bright eyed, bushy haired youngster who had just started out on his Watford supporting journey. The old man had taken me to my first game towards the end of the 79-80 season and despite a home defeat to Shrewsbury, I was hooked. Dad continued to feed my hunger for my new found interest and when he wasn’t available, my Granddad or Uncle would take me to the odd game. The males of the family weren’t the only ones to provide me with the means to support my local club. My Mum also joined in the fun. Football clubs weren’t as commercially astute back in the early 80’s. I don’t recall there being as many WFC related products as there are today, but that might just be a sketchy memory from my childhood. Anyway, they certainly weren’t changing the shirts every season! In fact I used to get quite excited with the anticipation of the small catalogue dropping through the postbox each summer, displaying not only the contents of the Hornet Shop for the coming season, but usually my first look at the new season’s fixtures as well. Yes mum, I agree. He’s too small and cuddly to be like Les. Sorry Wilf, if you happen to be reading this. Or should that be sorry Les? So that’s where Wilf came from. And he’s still with me today. Thankfully for him, unlike his keeper, he’s managed to keep all that curly hair. Even if it isn’t as bright as it used to be. 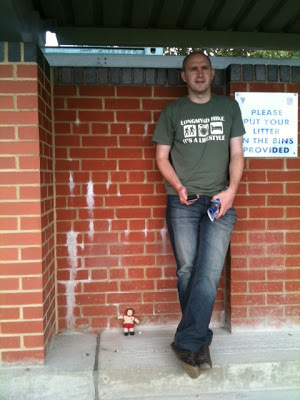 And last week Wilf went to his first ever Watford game as he joined the From The Rookery End team on the pre-season trip to AFC Wimbledon. I think he enjoyed it, despite the result. He doesn’t get out much. So why is Wilf in the 100 objects? For me there’s two reasons. Firstly, it always makes me smile when the Match of the Day or Sky Sports cameras pick out the old boy with the hat his wife knitted for him back in the seventies, or the mother with her home made rosette on FA Cup Third Round day. You know they’ve been made with care and appreciation of the wearer’s love for his or her club. Secondly, he reminds me of a more innocent period of football. When Division Four was Division Four, playing for your country meant something and your team had a genuine chance of establishing themselves when getting promoted to the top flight without spending millions. Thanks for the memories Wilf.